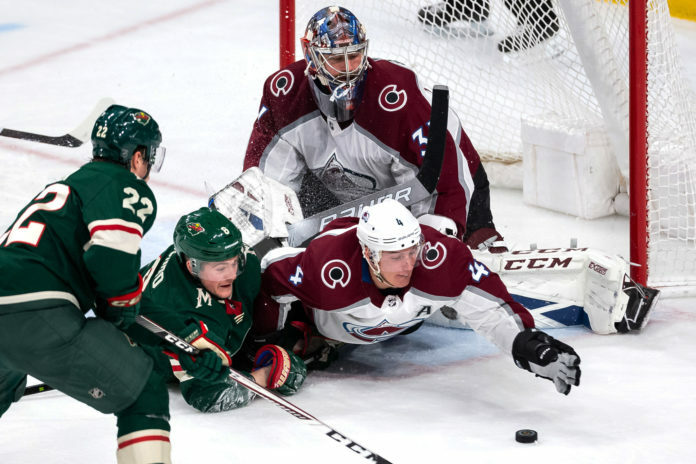 Needing a regulation win against a team in front of them in the standings, the Colorado Avalanche went into Minnesota and played a strong 60 minutes of hockey on their way to a 3-1 victory. The win puts the Avs two points behind Arizona for the final playoff spot in the Western Conference with the same amount of games played. They now head to Dallas to take on the Stars, another team they’re chasing. Philipp Grubauer finally looks the part. 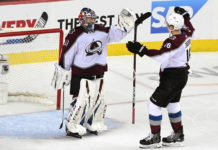 It took a while, but Grubauer sure is starting to look like the goaltender the Avs thought they were acquiring last summer. The German goaltender stopped 36 of the 37 shots he faced tonight, and made several of the acrobatic kind, including a stretching stop on Pontus Aberg in the third period. He looks calm, cool and collected in net, much like he did in Washington. Perhaps there was just a big adjustment period to a new goalie coach and team, but this is an encouraging stretch. Defense in crunch time. 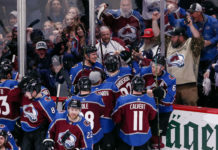 The Avs dressed seven defensemen again, but when the third period came around, Bednar relied on his regulars, as Ryan Graves only took two shifts in the final period. Forwards on the clock. 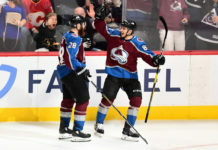 Dressing only 11 forwards means that the Avs are riding their horses up front, as Nathan MacKinnon, Mikko Rantanen and Carl Soderberg all played well over 20 minutes tonight. For reference, only one defenseman (Erik Johnson) crossed the 20 minute mark. Tyson Barrie is on a roll. His goal Tuesday night was a near identical goal to his first marker against the Devils. He made a perfect read pinching in from the point and used the screen perfectly to blast it past Devan Dubnyk. He’s not a perfect defenseman in his own end, but replacing 50+ points is not easy to do and until the Avs have someone that can put up those numbers from the blue line, Barrie is pretty irreplaceable. Bad luck. It’s entirely possible that Colin Wilson never scores another goal in his life with the luck he’s had the last month. He’s hit posts, missed open nets and been robbed by goaltenders left and right. Tuesday night, he had a goal disallowed due to goaltender interference and had another hit the post. He didn’t dwell on the disallowed goal for long, as moments later he set up Tyson Jost for the game winner with a beautiful stretch pass.